Abraham Anghik Ruben has become a major innovative force among contemporary Inuit sculptors. His imagery derives from the rich early history of the Arctic in North America, bringing together the myths, legends, and stories of the early Viking expeditions to the New World and that of his ancestral Inuit peoples. 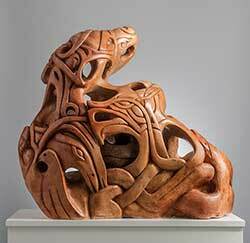 Born in Paulatuk, Northwest Territories in 1951, Ruben creates his powerful and compelling sculptures with exquisite detail at his studio in Salt Spring Island, British Columbia. Presented in collaboration with Kipling Gallery, Vaughan, ON. This exhibition is made possible with support from the Michigan Council for Arts and Cultural Affairs, the National Endowment for the Arts, and the Robert T. and Ruth Haidt Hughes Memorial Endowment Fund.